Size of the ring is the impact force. Green is a positive impacts, red negative. Orange is on the side of red, and Grey must be considered. 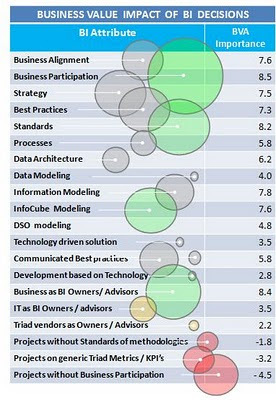 So a large grey circle 'BI Strategy' or 'BI Best Practice' are both highly essential components. Whereas the big green circle for 'BI Standards' is mandatory. Good standards that is not the R/3 legacy of Z and Y standards. Similarly ' So a large circle, i.e. 'Business as BI Owners / Advisors' is a very positive impact. Whereas the last one 'Project without business participation' is a large red circle thus a very negative impact. Use this as a checklist for your project in the future, or one for the past and see if it stands true. Every small decision we take has a monumental impact on the BVA (Business Value Attainment) component of a DW project. It is critical for decision makers to identify their Devils before they do their Angels. It is equally critical to identify your angels as they are the ones to bring you success. The above diagram is an example of the different components involved in a BI decision process and the impact they have on the BI project.